I can’t believe summer is coming to an end; how is it almost September? The last few months flew by – a blur of work, school, and so many great vacations. I haven’t been able to cook much this summer – I spent most of my days traveling for work or traveling for fun – so every moment I get in the kitchen is extra special. Mike and I finally had a quiet weekend at home to get caught up on housework and finally relax. A trip to the farmers’ market inspired this dish packed full of local foods – sweet corn, gorgeous cherry tomatoes, zucchini, and cheese. Seriously – there is nothing quite like Wisconsin sweet corn (sorry, Cape Cod, but the corn we had out there was terrible). I served these fritters with a side of zucchini noodles sautéed in a bit of olive oil and lightly seasoned with some roasted red pepper and garlic seasoning we got from Soulard Spice Shop. Heat 1 teaspoon oil in a large non-stick pan over medium-high heat. Add half the onions and sauté for 1 minute. Add the bell pepper and chile peppers and cook for an additional 2 minutes, or until vegetables begin to soften. Add sweet corn and cook for two minutes, or until corn softens. Season with salt and pepper to taste. Set vegetables aside to cool. Meanwhile, combine the corn meal, flour, sugar, and 1/2 teaspoon of the cayenne in a large bowl. In a small bowl, whisk together buttermilk and egg. Add the buttermilk mixture to the dry ingredients and mix until just combined. Stir in the vegetables, cheese, and basil. Heat 1 teaspoon oil in a large non-stick pan over medium heat. Add the remaining onion and cook until softened, about 2 – 3 minutes. Stir in tomatoes and season with remaining 1/2 teaspoon of cayenne, salt, and pepper. Cook until tomatoes begin to soften, about 2 minutes. Set aside and keep warm. Heat a very thin film of oil in a large non-stick frying pan over medium heat. Working in batches, cook 1/4 cup scoops of batter in the oil. Cook 2 minutes per side, or until fritters are golden brown. Repeat with remaining batter, adding more oil as needed. 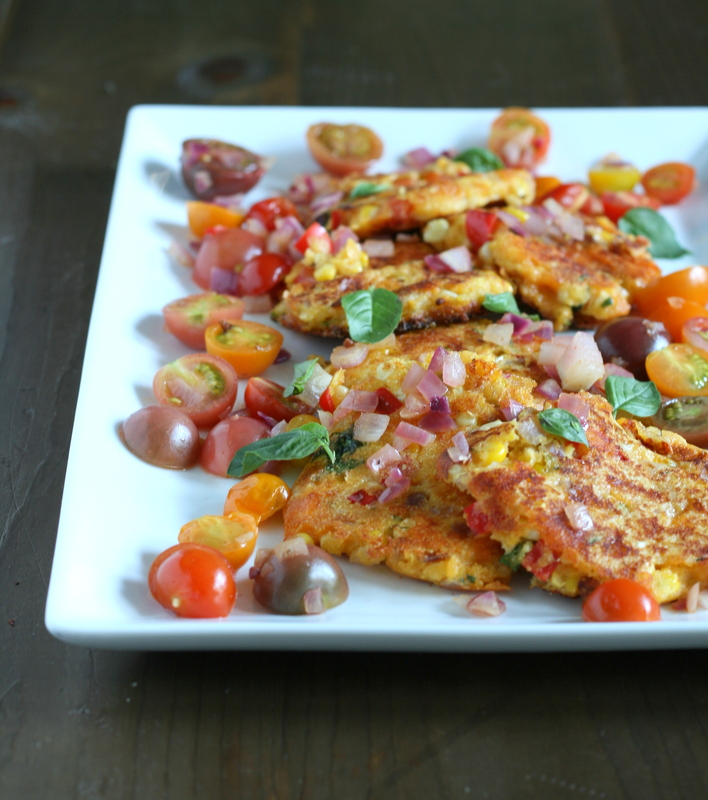 Serve fritters immediately with sautéed tomatoes. Categories: Farmers Market, Food, Main Entrees, Meatless, Quick & Easy, Special Diets, Vegetarian & Vegan | Tags: farmers market, food, main dish, meatless, quick and easy, vegetables, vegetarian | Permalink. I love weekends more now than I ever did before. Weekends are associated with quality time with Mike and my pups; something I took for granted when I could come home to them every night. Weekends are associated with cooking new foods since cooking for one on during the week isn’t really all that fun. I love binge watching shows on Netflix with Mike, going for long walks with the dogs, and cooking up food for us to enjoy as a couple. 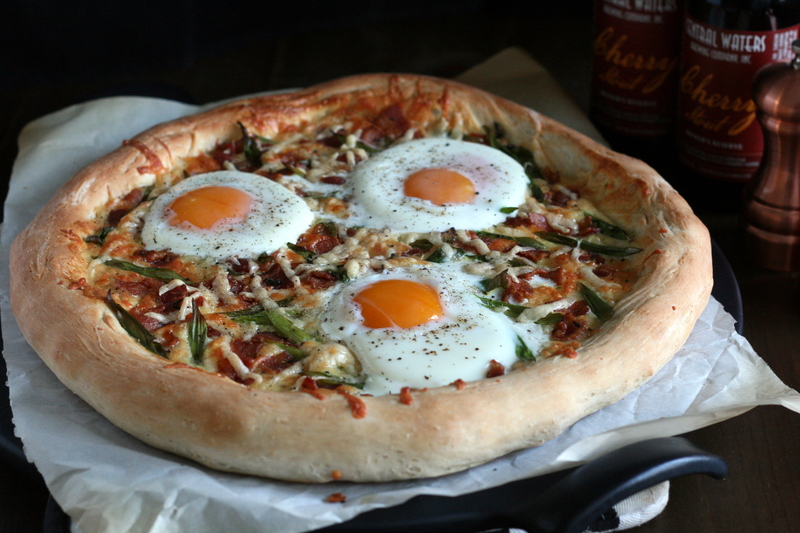 This weekend, I was inspired to make a carbonara pizza after I bought some farm fresh eggs. The grocery store eggs don’t even come close to fresh eggs. Really. I wanted to showcase the eggs in something wonderful. 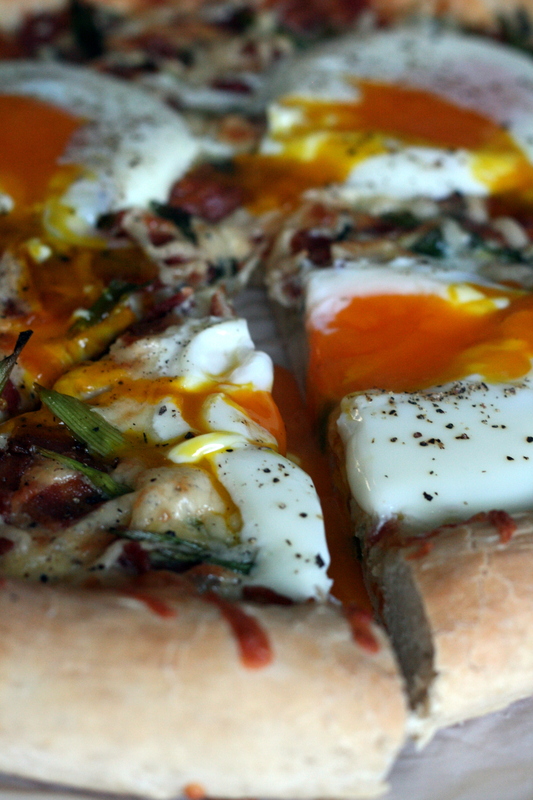 What better way to do that than incorporate the eggs into a creamy sauce for the pizza and then crack a few on top? Eggs, cheese, bacon – you honestly can’t go wrong with that combination. Preheat oven to 450°F. Place a pizza stone or baking sheet in the middle of the oven to heat up for at least 30 minutes. To make the dough: Fit stand mixer with dough hook. Combine dry ingredients in mixing bowl. Pour in oil and water. Mix on low speed until dough pulls away from side of bowl and gathers around hook and is smooth and elastic. Place dough in a large lightly greased bowl and cover loosely with plastic wrap. Set aside and let rise for 30 – 40 minutes. While dough is rising, cook bacon in a large pan with thyme and garlic until crispy. Remove cooked bacon from the pan and drain on a paper towel. Discard bacon drippings, garlic, and thyme. To make the sauce: Place 4 ounces Parmesan, 2 eggs, and 1 teaspoon of black pepper into a food processor and blend until smooth. To form the dough: Place dough on a flat surface. Gently press the center to create a large dimple. Gently push it outward from the center with your fingertips. Pick up the dough circle and, holding it under the rim, turn the dough in a circle; gravity will gently stretch the dough. Drape the dough over the back of your hands and gently stretch outward while rotating. Your pizza dough should have a thinner middle and a thicker edge. Place the dough onto a piece of parchment paper. Spread the sauce over the dough. Sprinkle shredded mozzarella on top, followed by bacon and green onions. Top with remaining 2 ounces of grated Parmesan. Slide pizza onto preheated pizza stone and bake for 10 minutes. Remove pizza from oven and use a large spoon to create 3 indentations on the top of the pizza. 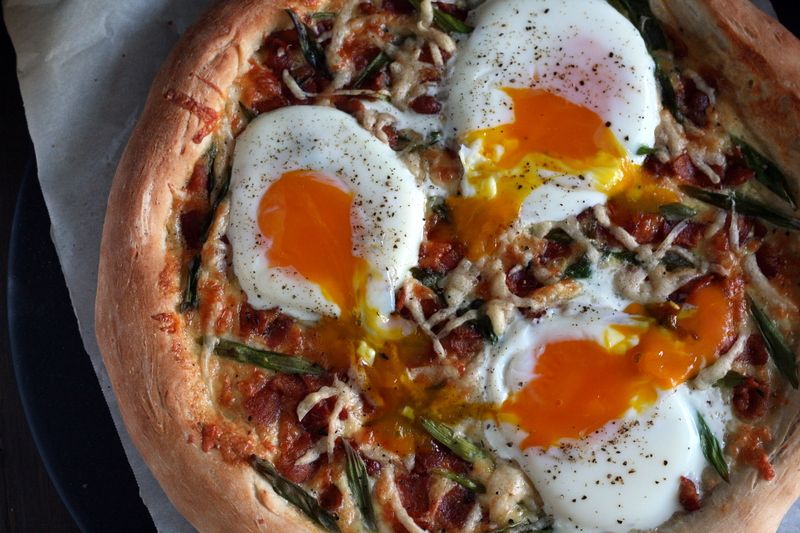 Crack the 3 remaining eggs into each of the indentations and return the pizza to the oven for 3 – 5 minutes, or until the egg whites are set but the yolk is still runny. To serve, use a knife to break the yolk and spread it around. Season with freshly ground black pepper before serving, if desired. Categories: Food, Main Entrees, Meat, Pizza, Pork | Tags: main entree, meat, pizza | Permalink. Years ago when I first started blogging, I posted about slow cooker ribs. 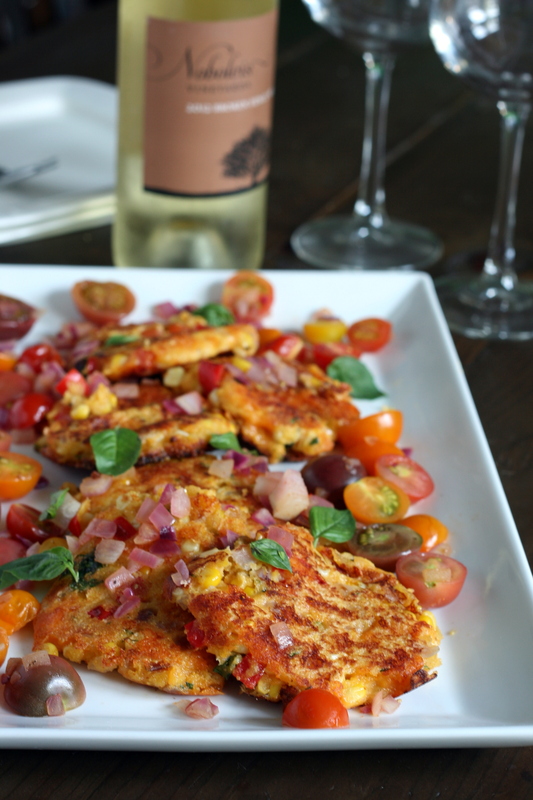 To this date, it’s one of the most popular recipes on the blog. My cooking techniques and recipes have evolved over the years and I thought that it might be a good time to make an updated post about my favorite ribs. Instead of baking the ribs first, I bake them after the slow cooking to get the caramelized stickiness that we all know and love. I also start the ribs out with a rub to give them an extra dose of flavor. I know that some people might consider sticking ribs into the slow cooker sacrilegious, but it works for me and I think the results are pretty stellar! Plus, I don’t know the first thing about starting up a grill. That’s Mike’s domain. As a side note – that beer you see in the back? Amazing. Two thumbs up for Southern Tier and their amazing Choklat stout. Make the rub: mix all ingredients together. Season ribs evenly with the rub to taste. Brush 1 cup of the barbecue sauce over the ribs. Arrange ribs along the side of the slow cooker insert or cut ribs into thirds or halves and place them in the bottom of the insert. Pour in beer and add onion and garlic cloves. 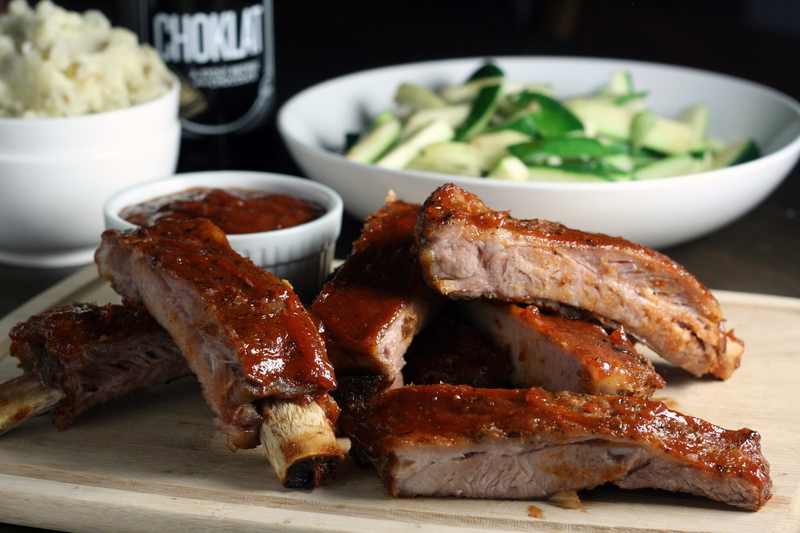 Cook on high for 3.5 – 4 hours or until ribs are tender but not falling off the bone. Preheat oven to 350°F. 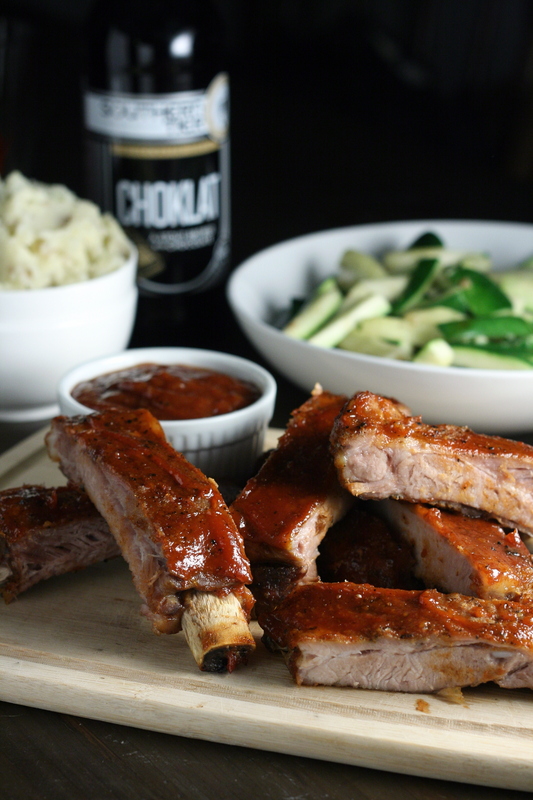 Transfer ribs to a baking sheet and baste with remaining barbecue sauce. Bake for 10 – 15 minutes, turning every 5 minutes and basting with additional sauce as needed. Categories: Cooking with Alcohol, Dairy Free, Gluten Free, Main Entrees, Meat, Pork, Slow Cooker/Crock Pot, Special Diets | Tags: cooking with alcohol, main, meat, pork, slow cooker | Permalink. Is it cold where you live? Do you have mountains of snow outside your window? Are you short on time? Do you hate doing dishes? Do you love comfort food that warms you up? 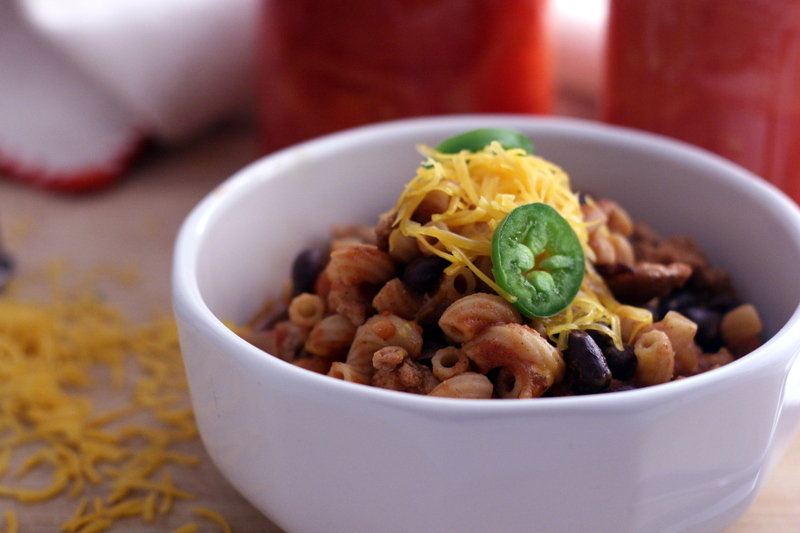 If you answered yes to any or all of those questions, this chili is for you. Tossing everything into the slow cooker means you don’t have to spend hours standing over the stovetop, stirring and tending to your chili. Plus, who doesn’t love coming home after a long day to a house that smells amazing? Heat oil in a large skillet over medium-high heat. Add beef, onions, and garlic and cook until beef is no longer pink, about 7 minutes; stir with a spoon to break beef up into smaller pieces. Add chili powder and cumin and stir to coat. Cook for 1 – 2 minutes or until fragrant, stirring frequently. Transfer mixture to a slow cooker. Stir in bell peppers, mushrooms, tomato sauce, diced tomatoes, and kidney beans. Cover slow cooker and cook for 6 hours on high or 8 hours on low. Season with salt and pepper to taste before serving toppings of your choice. Categories: Beef, Dairy Free, Food, Gluten Free, Main Entrees, Meat, Money Matters, Quick & Easy, Slow Cooker/Crock Pot, Soups, Stews & Chili, Special Diets, Stews & Chili | Tags: beef, chili, dairy free, gluten free, main dish, main entree, meat, money matters, quick and easy | Permalink. Football season is over this weekend. I don’t know what I’m going to do with all my extra time. What am I going to eat now that game foods are out? I’m assuming that eating spinach artichoke dip for lunch isn’t acceptable unless you’re watching football. On second thought, it’s probably not acceptable during football season either. Once in a while, I will eat real food during a football game. You know, something that isn’t 99% cheese. Like this super easy slow cooker Italian chicken sandwich. Holy bucket of yum, I tell ya. If you don’t have your Superbowl menu set yet (shame on you! ), make sure you get this delicious sandwich on there! Your friends and family will thank you. Place chicken in the bottom of a slow cooker and sprinkle with dressing mix. Top with pepperoncini, giardiniera, and chicken broth. Cover and cook on low for 6 hours. Remove meat from slow cooker and shred with two forks. Alternatively, place the chicken into the bowl of a stand mixer fitted with the flat beater. Beat on low for 30 or so seconds or until chicken is shredded. Return shredded chicken to slow cooker for 5 minutes. 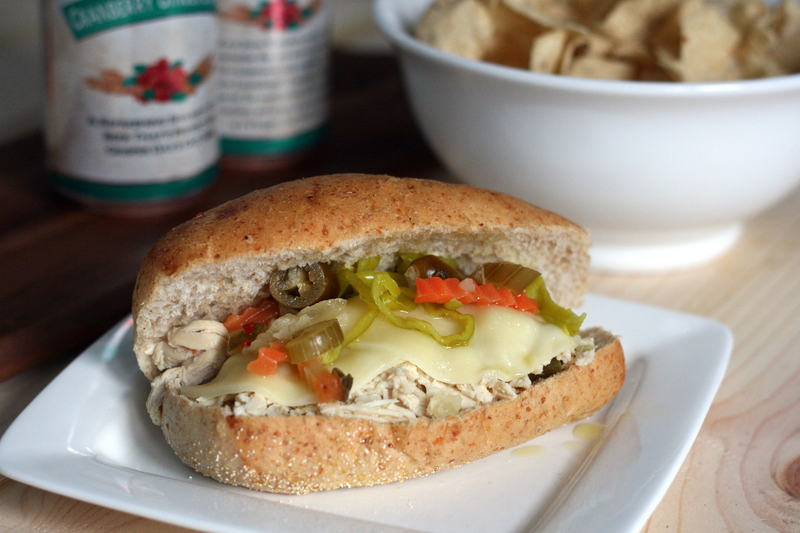 Scoop chicken onto buns and top with provolone cheese, giardiniera, and pepperoncini. Serve immediately. Categories: Chicken, Food, Main Entrees, Meat, Quick & Easy, Sandwiches, Slow Cooker/Crock Pot | Tags: chicken, main dish, main entree, meat, quick and easy, sandwich, slow cooker | Permalink. When I hear the word casserole, images of cheesy, fatty, not-so-great-for-you comfort food comes to mind. What if I told you that you could have all the comfort food flavor without all the bad stuff? 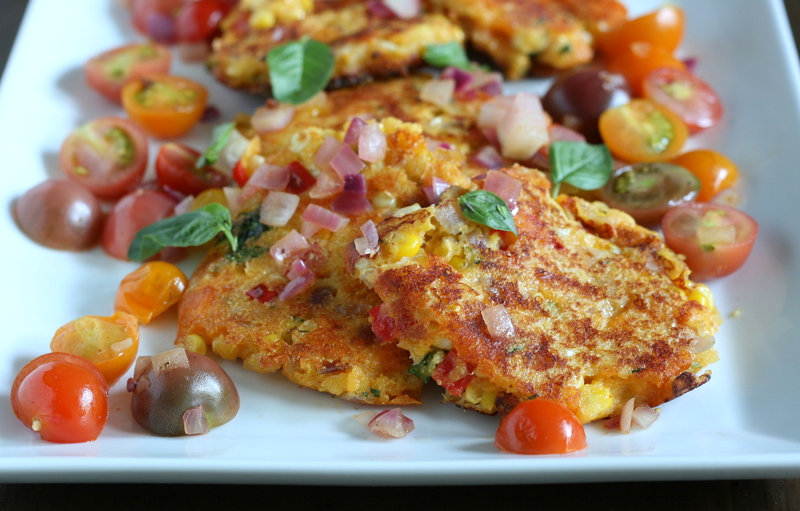 This dish is loaded to the top with veggies and whole grains. It’s a dish you can feel great about eating. Preheat oven to 350°F. Spread cooked rice in the bottom of a 9×13 baking dish. Heat a large pan over medium-high heat. Spray with cooking spray. Add chicken and cook until cooked through and no longer pink in the middle. Remove chicken from pan to a separate bowl. Add onion, garlic, mushrooms, bell pepper, and jalapeno to pan. Cook until vegetables just begin to soften. Stir in soup, broth, mayo, and mustard until well combined. 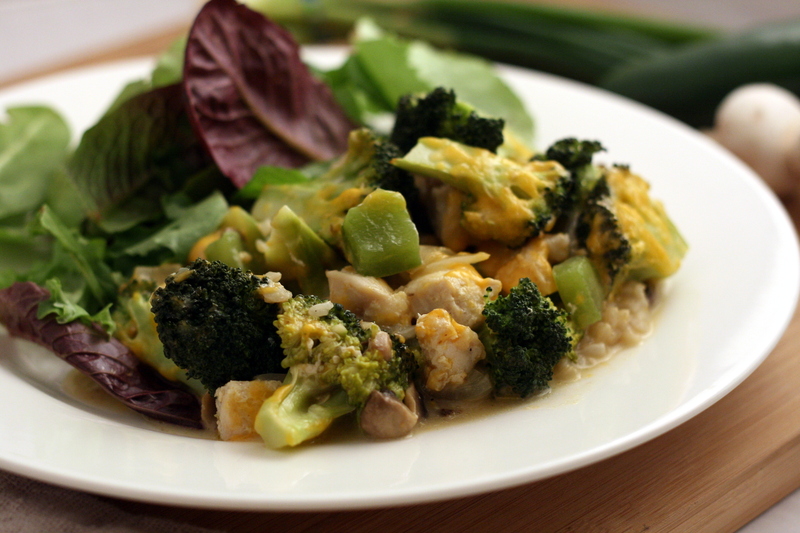 Mix in broccoli, 3/4 cup of the cheese, and the cooked chicken. Scoop mixture on top of rice in baking dish and sprinkle remaining cheese on top. Bake in preheated oven for 20 minutes or until cheese is bubbly. Allow to cool 5 minutes before serving. Categories: Chicken, Food, Main Entrees, Meat, Money Matters, Quick & Easy, Rice | Tags: chicken, main entree, meat, money matters, quick and easy, rice | Permalink. 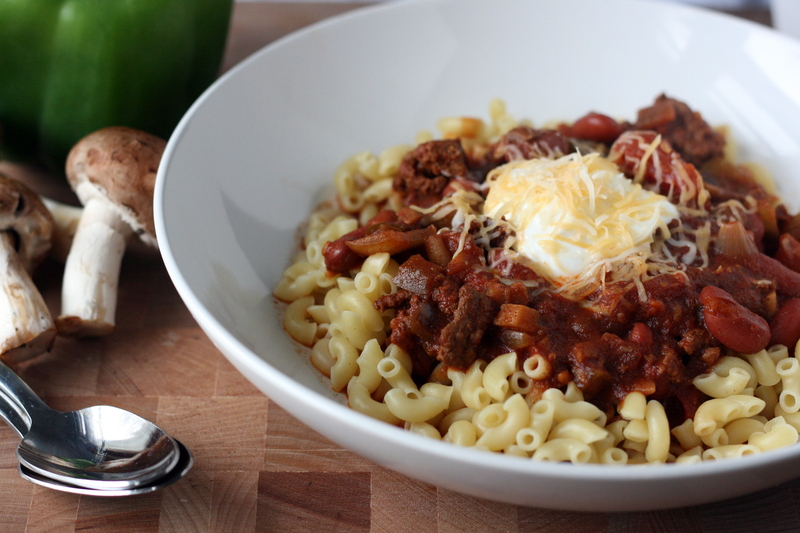 Chili is one of my favorite winter comfort foods. We just got out of a mega deep-freeze up here in Wisconsin (“feels like -35°F” is something I would be OK with never seeing and feeling again) and this spicy turkey chili mac hit the spot. I made this on one of the nights that Mike and I were apart, so having to wash only one pot was a huge bonus. Doing dishes is the least exciting part of cooking. Heat a large skillet over medium-high heat. Cook turkey, onion and garlic until meat is browned and cooked through and onion is tender. Stir in beans, tomatoes, tomato sauce, pasta, jalapenos, chili powder, and cumin. Bring mixture to a boil and reduce heat to medium-low and allow mixture to simmer. Cook, covered, for about 15 minutes, or until macaroni is soft, stirring occasionally. Season with salt and pepper to taste. Top with optional toppings before serving. *I used a pint of quartered tomatoes I canned over the summer. Categories: Food, Main Entrees, Meat, Money Matters, Pasta, Quick & Easy, Stews & Chili, Turkey | Tags: chili, entree, main entree, money matters, pasta, quick and easy, turkey | Permalink.